I took this photo from the rooftop café of La Rinascente, a swanky department store in central Palermo. This is PIAZZA SAN DOMENICO. On top of the giant column stands the virgin Mary. The piazza takes its name from the Chiesa San Domenico, which is out of frame to the left. The street with red awnings along it is the Vucciria market, founded by the North Africans over 1,000 years ago. Apart from fresh fruit and vegetables, it mainly sells specialist foods, spices and curiosities. You can buy traditional and luxury Sicilian products like Bronte pistachio pesto, sun dried tomatoes, capers, cold-worked chocolate from Modica, cinnamon liquer from Etna, and other types of unusual and luxury foods and drinks. For one millenium it bustled with people from Palermo buying grocoeries, but over the last ten years the area has filled with immigrants from Africa and Bangladesh (among other places), who buy their food from each other’s ethnic shops. The market is much emptier than it used to be. I do hope it doesn’t just gradually fade away. Is it that the prices at the 1000-year-old markets are too high for the new immigrants? And are the former customers avoiding the area because they maybe don’t feel comfortable mixing with the new folks – because of differences in language, culture and finances? Well, the Sicilians are definitely not avoiding mixing with the immigrants. Sicilians are the most un-racist people, and the most quietly respectful of people from other nations, that I’ve ever mixed with in my life (despite their tendency to be wary of strangers in general). But yes, the prices may be too high for the immigrants, especially as Sicilians tend to increase their prices at the first sign of a foreign accent. They assume all tourists are richer than them and can afford to pay absurdly bumped up prices, and some of them may be daft enough to try the same trick with immigrants, not realising they have less money than most Sicilians. Even after 8 years I still get people sometimes asking me ludicrous prices or trying to short change me. Even in the supermarket. It’s like an obsessive compulsive disorder or something, and extremely irritating. Great photo. I am curious as to how you got such a great aerial shot of the piazza. Last time In Palermo I had breakfast at La Antica Gelateria Lucchese right there with the blue tables. Until then I had no idea that Palermitani ate ice for breakfast. I’ll take a brioscia filled with ice cream over a bowl of cereal anytime. Ice cream sandwiches for breakfast – such a great way to start the day! You just mentioned one of my favorite Sicilian creations. Could have it for breakfast often. In Lipari, a sidewalk cafe would not serve it to me as a late night snack. Not done. I pleaded. Sono strangliere. Still no. Fantastic picture with a cloudy sky with stunning blue shades and the mountains in the background!I’ve also visited Palermo for a couple of days two years ago and I fell in love with this city and above all with the charisma of people living there! Thank you! I’m glad you enjoyed your trip to Sicily. Do you think you’ll visit again? Yes, sure..I would like to do a tour around the island. I think that there are many many palces and areas that worth a visit in Sicily, not only for the landscapes, but also for the cultural features. Isn’it? Yes, definitely. I think you could fill about 6 months with sightseeing in Sicily. 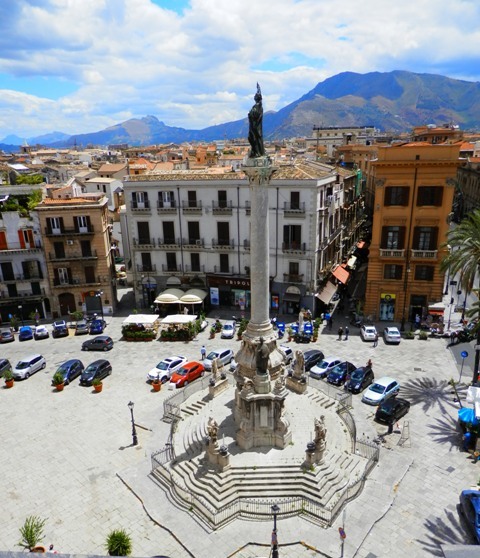 It’s a goldmine of information about Sicily (not only tourism but real insights into culture, history etc) which I bet would get you daydreaming…. !